Free Printable Halloween Party Invitations. Free Printable Halloween Party Invitations, a great printable to invite all your friends and save some money for other things you need for the party. You can print and use the Halloween Party Invitations for your next Halloween Costume Party on this October 31. 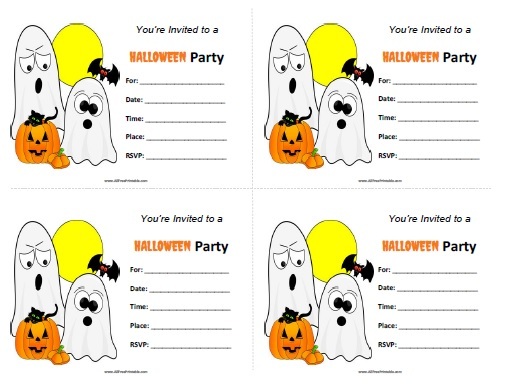 Print the Halloween Party Invitations using your inkjet or laser printer with card paper and cut along dotted line. Then write for who is the party, date, time, place, rsvp. Includes a Halloween theme with ghost, bats, pumpkin, cat and moon. Download the Halloween Party Invitations template, 4 invitations per page.